When an Apple iPhone powered by iOS 8.2 is paired with the Apple Watch, the Apple Activity app will appear on the handset. The Apple Watch is used to set the features of the app, which is then unlocked on the phone. This was revealed by developer Hamza Sood, who passed along his discovery via a tweet that he sent out the other day. It was also mentioned by Apple, which included it in its changelist for iOS 8.2. The latter was released on Monday. Keep in mind that only the Apple iPhone 5 or higher can pair with an Apple Watch. 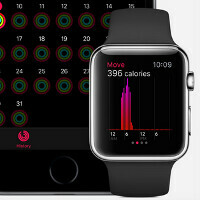 The Activity app works with the Apple Watch to help track your workouts and activities that keep you fit. It also releases this information to the Health app on the iPhone. The Apple Watch itself has an Activity application that shares a common UI with the iPhone version. With the permission of the user, the data on the Activity app can be passed along to a third party fitness application for further analysis. 4-24-15. Already got the day off with pay. Mxy, what's the plan?